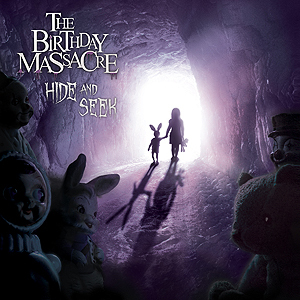 Blurb: Despite exploring darker themes and tighter production and performance to display some degree of maturity, The Birthday Massacre ultimately deliver an album consistent with the band’s established tropes. At times, there is comfort to be found in a certain level of consistency from a band over the course of several releases. Although it can indicate a lack of development or variety, when you have a singularly identifiable sound as The Birthday Massacre, one need not deviate too much to appease the audience. As well, this is not to say that the Ontario sextet hasn’t made significant strides in production and performance since first appearing on the scene a decade ago. On Hide and Seek, those strides make themselves apparent by way of tight arrangements that result in a very concise and straightforward album; the shortest in the band’s discography in fact (and that’s including the EPs). Right off the bat, as the sound of rainy streets leads into Chibi’s saccharine and sweet vocals amid a pulsating bass and twinkling synths on “Leaving Tonight,” Hide and Seek plunges the listener into the familiar gothic fairytale that is The Birthday Massacre’s musical world. And yet, from this song alone as the vocal harmonies in the chorus resonate forceful yet melodic, the guitars crunchy yet smoothly meshing with the synths to create a rich sonic haze, it’s clear that the band – along with Dave “Rave” Ogilvie’s production – has achieved a clarity of sound unsurpassed in its oeuvre thus far. The same can be said of songs like “Calling” with its incredibly catchy chorus and danceable beat, echoing guitar arpeggios creating a shimmering and mystical backdrop, while “One Promise” hits hard and fast with an infectious rock hook that is instantly captivating as Chibi’s high voice shines with just a smidgen of grit to match the intensity of the music. However, this song – and others like “In This Moment” with its bouncy keyboards and reverberating guitar melodies, “Need” with its balance of desperate tunefulness and dark chugging dissonance, and especially “Down,” which bears a striking resemblance to the previous album’s “In the Dark” in tone and aggression – add to the case that The Birthday Massacre may have fallen into the category of the one trick pony. 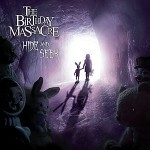 True that the music on Hide and Seek is consistent with the band’s established style, and the subject matter dealing with even more decrepit themes of death and unsolved murders and disappearances, coupled with the polished production and strong vocals make for a more mature sounding album for The Birthday Massacre. The album wastes no time, each song playing as immediately as a shadowy kidnapper striking in the dark, mystifying and ensnaring the listener. Suffice to say that longtime fans will undoubtedly enjoy Hide and Seek, while newcomers may enjoy the album’s brevity; just don’t expect any real surprises from The Birthday Massacre this time around.